Certificate of Authority – Insurance Commissioner Dennis B. Funa (center) hands over the new Certificate of Authority for Corporate Guarantee and Insurance Company to Chairman and President Levy P. Laus (left), and Chief Operating Officer Carmelo B. Alabado (left). City of San Fernando — The Corporate Guarantee and Insurance Company, one of the strongest non-life insurance firms in the country, has been granted the renewal of its three-year certificate of authority by the Insurance Commission. The certificate is for the period January 1, 2019 to December 31, 2021. The certificate was handed over by the Insurance Commissioner Dennis B. Funa to Corporate Guarantee’s Chairman and President Levy P. Laus together with Chief Operating Officer Carmelo B. Alabado during a simple ceremony at the Insurance Commission last December 4, 2018. 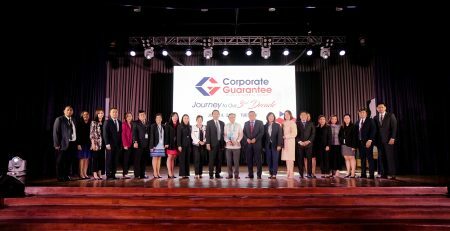 One of the marquee companies of the LausGroup, Corporate Guarantee remains on top of the list of non-life insurance firms which have been trimmed down from 120 to around 54 this year. Some had reportedly been closed or merged with non-life companies to meet the capital requirement set by the commission. The capital requirement for 2019 was pegged at P900 million and will be hiked to P1.3 billion on 2022. Laus, who has recently been named one of 33 most influential people in the Philippine auto industry, has expressed confidence that Corporate Guarantee will meet the capital requirement. Established in 1997, Corporate Guarantee has the exceptional distinction of being one of only two insurance companies in the Philippines operating outside Metro Manila, a stature attributed to Laus’ advocacy for countryside development. Moving into its 21st year with over P1 billion in assets, it is also one of the only six non-life insurance companies with ISO 9001:2015 certification for its quality management system. 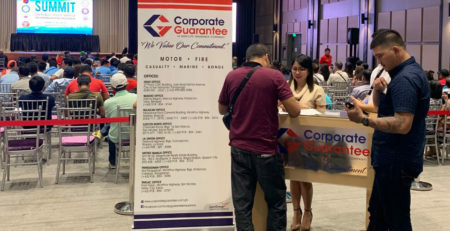 Corporate Guarantee has now 6 sub-offices in Metro Manila, Central and Northern Luzon.